I have a lot of trees in my garden. 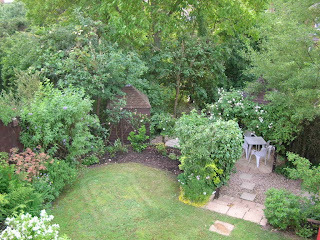 This photo is only one corner of it, besides the full grown walnut, there is an oak and a twisted willow out of view. At this time of year much of the garden regularly looks like this. a) How he can look so pleased post vacuum this weekend when the number of leaves to come down is still a larger balance than those cleared away so far. b) His comment "Now you won't have as many to do when I'm not here next weekend". This definitely implies an expectation that I would vac leaves. Not before every last one has fallen I wouldn't! Nope not me.